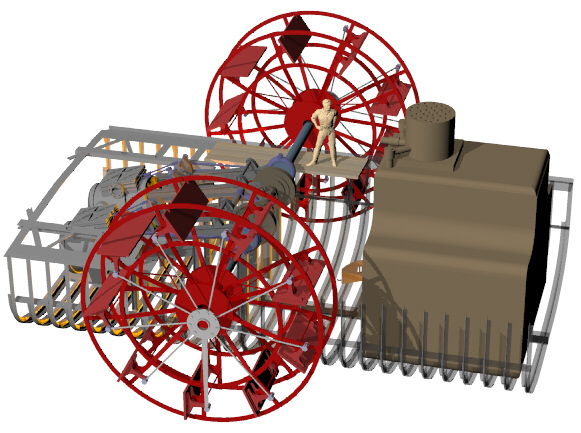 Denbigh Project team members recently began using computer modeling techniques to assemble a detailed, three-dimensional recreation of the blockade runner. Visibility at the wreck site is very poor, rarely exceeding two feet, so photographing the wreck is impossible. 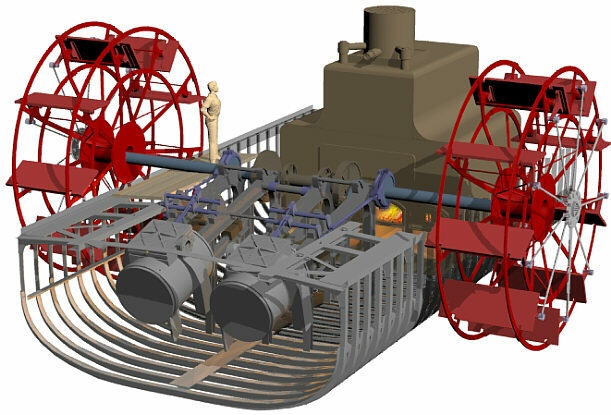 Digital modeling allows investigators better to understand how the different parts of the ship worked together, how machinery might have been arranged, to orient divers to the site, and so on. Although digital modeling is time-consuming, it allows changes to be made quickly as new information becomes available. It looks cool, too. The images above and below show Denbigh's midships section, including her boiler, engines, feathering wheels and hull framing. They reflect project investigators' best understanding of the ship based on historical and archaeological evidence gathered through the 2000 field season. Like any other archaeological interpretation, this model is subject to change as more data becomes available. Sunday, January 28, 2001 Revision.